Connecting with traumatized youth came easy to me. As someone who struggled with addiction, I empathized with their impulsivity. After getting sober at 25, my life revolved around comic books and my gig social working at a day treatment school for children with behavior needs in Albany, New York. Not ready to start a family, I cared for students as if there were my own kids. On weekends, I roamed conventions as press for pop-culture blogs, interviewing my comic creator idols. Four years ago, at a comic con, I spotted a welcome sight–a real dog, lounging in a booth, getting petted by fans. I swerved past a crowd of cosplayers to reach Piggy, the three-legged border collie mix. I found out the pup had a comic loosely based on his life (with some super powers and villains thrown in), A Piggy’s Tale, and I scored an interview with the co-author, the dog’s owner, Tod Emko. I was shocked how much the canine had been through, how much his experiences related to the kids I worked with. Volunteering as a conservationist in the Dominican Republic, Emko discovered Piggy by the side of the road. The dog was hit by a bus, covered in ticks, dying, alone. The vets performed emergency surgery, amputating the pooch’s rear leg. He was a survivor, like the 20 diverse kids I saw daily in groups and individual sessions, aged 6 through 12, who had witnessed addiction, abuse, and death, many having been removed from their birth families. Emko adopted the collie, affectionately naming him because of his pink skin, bare after he nervously gnawed off his hair. Together, they boarded the plane home to New York City. While taking Piggy for walks, Emko discovered his pet’s super power: empathy. As if searching for a bone, the good boy could sense seniors suffering from severe arthritis, people on the verge of panic attacks, children injured. He would drag Emko to the person in need and place his paw on them, easing their pain. After acing his therapy dog final, he spread joy to hospitals and schools. To raise money for charity, Emko teamed with illustrator Ethan Young to independently produce the paper and digital comic. In it, the fictionalized version of Piggy teams with other misfits to stop a madman from experimenting on lost animals. It was a story I knew the kids I worked with would appreciate, since most had learned to mistrust adults. Caretakers let them down. Social workers made promises they never kept. But the 3-legged tail-wagger provided a protector they could trust. They wrote letters to Piggy, thanking him for looking out for abandoned animals. One student promised to send squeaky toys. Emko printed their squiggly drawings in the back of issues. Searching for a motivational story, British Channel Four Television filmed Piggy traveling to visit the Albany school I worked in. “Wow, he went through that,” one of the kids said to the reporter, “maybe I can go through it as well.” The children I helped wrote graphic narratives about their lives, becoming the heroes in their histories. Through their art, they faced their traumas, feeling more empowered to choose their future. They penned versions of their stories with happy endings, yet Piggy’s reality turned dark: comic icons weren’t supposed to get sick. Although his fictionalized version never aged, in real life he was 9 (63 in dog years), and his single rear leg carried too much strain. 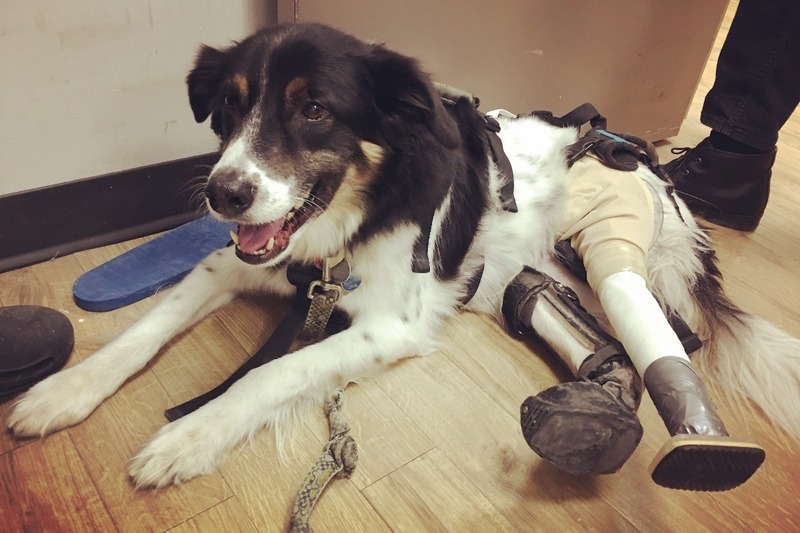 This past February, doctors worked to make him a prosthetic. They ran testing and diagnosed him with lymphoma. Suddenly, my students’ guardian was dying. How could I tell them? I spoke to parents and co-workers, looking for feedback. I thought of the unexpected life changes many of these children had gone through: foster homes switched without planning, Child Protective Services showing up with no warning, parents found unresponsive after overdoses. I knew unpredictability could trigger previous trauma in the students, but teaching them serenity through life’s twists seemed essential, even as I grasped desperately to my own false version of everlasting youth. As much as I wished I could protect the kids from the reality of diseases, this was an opportunity. We could prepare. Sickness happened. Possibly Piggy would survive, but we might have to say goodbye. Either way, our hero needed our help. I called the children together and read them Piggy’s GoFundMe. I explained the diagnoses. The kids turned silent. “Piggy’s dying?” one asked, his voice cracking. The kids talked about their own dogs passing away someday. They knew more than I expected about animal lifespans–the joyful briefness of time spent with our favorite friends. I was shocked by their understanding of death as a part of life. They were more accepting than I was. They weren’t hardened, they were realistic. They had a spiritual outlook: a gratitude for the opportunity to share in life’s joys and losses, with an understanding that we need to support each other through it all. Instead of falling into depression, they planned. We collected bottles to recycle for donations to help with medical expenses. We sent Piggy letters. In each note, we told him we loved him, but we didn’t write “feel better” because we weren’t sure he would. Our superstar’s fighting hard, but in mid-September the cancer turned aggressive, causing Piggy to begin weekly chemo sessions. Still, the pooch’s oncologist is hopeful the cancer will go into remission and Piggy will live a long life. Since he can’t go running like he used to, it’s important he keeps his mind engaged–meaning more school visits. October 4-7, he will be a star attraction at New York Comic Con (in Booth 143), one of the true heroes at the event. Jay Deitcher is a writer and Licensed Clinical Social Worker from Albany, NY with over a decade experience as a therapist for children with behavioral and special educational needs. His writing has appeared in The Washington Post, Tablet, and The Lily. Follow him on twitter (@mrdeitcher) and check out jaydeitcher.com. Why We Must Let Go Of The Myth Of Dr. Martin Luther King Jr.